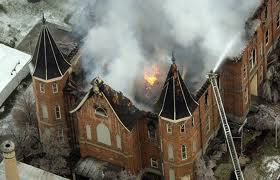 The burning of the much used and much loved LDS Provo Tabernacle (conference and performance center) in December of 2010 was a shock for the community and all those that knew the Provo, Utah area. 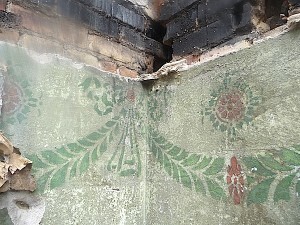 The following April, I was asked to do art conservation forensic analysis of the wall decorations in what was left of the burned out Provo Tabernacle building by the LDS Church History Dept. to find out details and make proposals. It had, since the fire, been gutted and cleaned out leaving the much publicized image of the shell of the building. As a side note, also a victim of the fire was a notable original painting of the restoration of the Aaronic Priesthood by Minerva Teichert. This painting, like all artwork, was self insured by the Church. So, while the $1.5 million valuation of the painting did not result in an insurance settlement, it was interestingly a wake up call to headquarters that there is a significant financially valuable heritage to be aware of, protected and preserved. This event put into motion mandates for better care and inventory of the History Department’s artifacts and has since evolved into a much greater sense of care of art and artifacts worldwide. 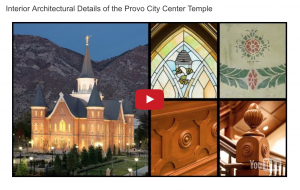 In this sense, the destructive fire in the Provo Tabernacle was a valuable and beneficial landmark event benefiting the historic preservation policies of the Church as a whole. I went exploring with scalpels etc through the burnt layers to identify what was original to the building. There were, if I remember correctly, 7 layers of paint and wall paper etc that had been applied over the ages. Then, I utilized various solvents to establish solubility parameters within projected uses of protective facing layers (and their removal) in the event of salvage and plaster removal. Tests were also done for potential cleaning procedures for the fire and smoke damage. Physically, knocking on the plaster layers helped me to see what voids were extant and gave me a general idea of the cohesion between plaster layers (to see if they had separated during the fire, water, etc). In areas of no decoration I did separation samples to see what the potential was for massiccio (en masse) detachment of wall plaster sections with design on them (perhaps for eventual historical displays). The onsite tests and discoveries were also photographed (the photos in the video below were provided my FACL) and videoed for future media needs. 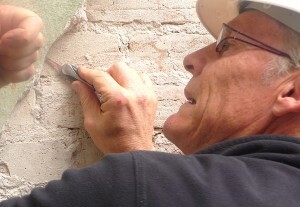 Figuring out the conditions of the paintings and walls, then doing cleaning tests of what was left of the decorative painted layers and examination of the plaster layers under the decorations of the burnt out meeting center allowed for planning by the History Department that would be passed on to other concerned departments. While proposals to recoup or salvage original sections of decoration were not followed, our work was much appreciated and helped with the historic recreation of the details in the new building. http://redeemer-of-israel.blogspot.com/2016/01/interior-architectural-details-of-PCCT.html PLEASE, leave a great comment at the bottom of the blog page… and pass the link around to others. I love this video presentation! This entry was posted in Travel and tagged Forensic studies, The Church of Jesus Christ of Latter-day Saints. Bookmark the permalink. A very bad situation for the old building, but one that could happen to any building with art in it. If it was not for art restoration experts like yourself, so much more would be lost in a fire like this. Great work! It is real sad to see an old building like this go down in flames, but when you can get inside to save a piece or two, that is the silver lining in the entire situation!